Heat 1 tablespoon of the oil in a medium non-stick frying pan over high heat. Add the chicken and prawns and cook for 4–5 minutes or until golden and cooked through. Set aside and keep warm. Add the remaining oil to the pan with the onion, garlic, chilli and paprika and cook for 2 minutes or until softened. 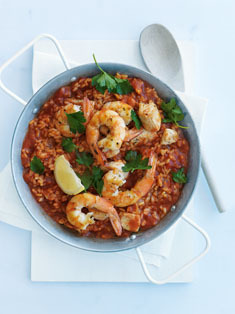 Add the rice, tomato and stock, reduce heat to low and cover with a tight-fitting lid. Cook for 20–25 minutes or until the rice is cooked. Stir through the chicken and prawns and cook for a further 1 minute. Top with parsley and serve with lemon wedges. Serves 2. Made this for tea tonight. The family loved it, even our 8 yr old went back for seconds. Recipe was really easy to follow, quick to make & had great flavours. I followed this recipe and found that there was a bit too much paprika. next time I will only put in half the specified amount. I loved it though!! It made a really nice dinner!